In the etzoldlab the challenges arising with the needed global energy change and future sustainable feedstock supply for chemical industry are the major research guideline. From the perspective of applied chemistry, a multidisciplinary approach is employed to provide scientific solutions for these challenges, especially for the complex interplay of catalytic materials within a full process or device. In the scientific approach, generic experiments play a dominant role. They allow controlling process conditions from highly idealized towards technically realistic and are combined with diagnostics providing in-situ information. Chemical reaction engineering simulations complement the experiments, giving especially insights into complex mass transfer phenomena and, therefore making a more holistic picture possible. As a future sustainable energy and chemical industry will need a concerted interaction of electrochemical and classical heterogeneous catalyzed processes both are studied. Based on this strategy, the research of the etzoldlab can be divided in three strongly interacting sub-groups: Advanced Catalytic Materials – Electrochemical Energy Conversion Processes – Heterogeneous Catalysis and Processes. More details on the research of these subgroups can be found in the sections below. The special focus lies on the development of carbon-based materials for catalysis in form of versatile supports or as catalysts themselves. In order to ensure a high reproducibility and highly pure materials, polymers and carbides are employed as the carbon precursors. Particular attention is paid to the precise control of the pore structure from the sub-nanometer towards the mm scale, including spatially varying properties. In this sense, core/shell carbon particles as well as hierarchically structured open cellular materials are prepared. For the later one an unprecedented high degree of freedom is available through a newly developed stereolithographic 3D printing route. For catalytic applications, surface functional groups are introduced or noble and base metals are deposited in controlled amount, size and shape on these carbons by various methods. The in-depth material characterization is the cornerstone in the etzoldlab to connect the resulting material properties with the synthesis procedure and conditions. Among the variety of characterization techniques applied, a special focus is on high-resolution physi- and chemisorption and thermogravimetric analysis coupled with mass spectrometry. T. Ariyanto, G.-R. Zhang, F. Riyahi, J. Gläsel and B.J.M. Etzold „Controlled synthesis of core-shell carbide-derived carbons through in situ generated chlorine“. Carbon 115, (2017) 442. M. Munoz, S. Ponce, G.-R. Zhang and B.J.M. Etzold„Size-controlled PtNi nanoparticles as highly efficient catalyst for hydrodechlorination reactions“. Appl. Catal. B. 192, (2016) 1. T. Ariyanto, B. Dyatkin, G.-Z. Zhang, A. Kern, Y. Gogotsi and B.J.M. Etzold “Synthesis of Carbon Core–Shell Pore Structures and their Performance as Supercapacitors”. Microporous and Mesoporous Mater. 218, (2015) 130. J. Gläsel, J. Diao, Z. Feng, M. Hilgart, T. Wolker, D.S. Su and B.J.M. Etzold “Mesoporous and Graphitic Carbide-Derived Carbons as Selective and Stable Catalysts for the Dehydrogenation Reaction”. Chem. Mater. 27, (2015) 5719. B.J.M. Etzold, I. Neitzel, M. Kett, F. Strobl, V.N. Mochalin and Y. Gogotsi, “Layer-by-Layer Oxidation for Decreasing the Size of Detonation Nanodiamond”. Chem. Mater. 26, (2014) 3479. V.N. Mochalin, I. Neitzel, B.J.M. Etzold, A. Peterson, G. Palmese, and Y. Gogotsi, “Covalent Incorporation of Aminated Nanodiamond into an Epoxy Polymer Network”. ACS Nano 5, 7502 (2011) 7494. A,B) SEM images of a 3D porous carbon in a spiral macrostructure; C) 3D printed porous carbon open-cell structure supporting the weight of a 1.7 kg steel cylinder. In electrochemical energy conversion processes the complex interplay of activity/selectivity and mass transfer of catalytic materials and carbonaceous electrodes in multiphase (gas/liquid) systems is studied. Processes are the polymer electrolyte fuel cell and electrolysis as also the CO2 reduction. 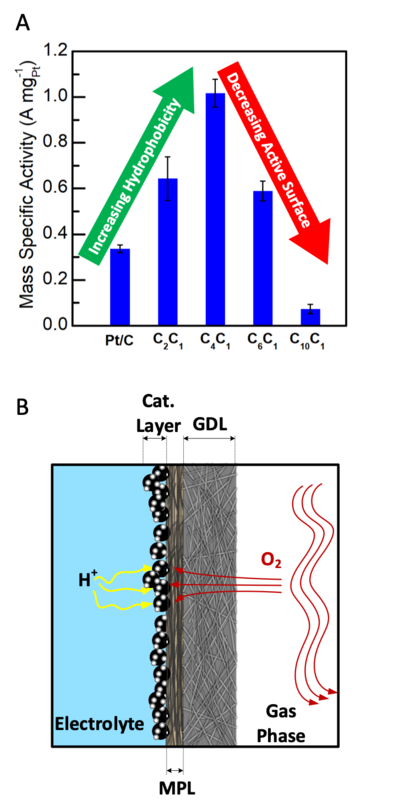 In this sense catalysts for the ORR, HER, OER and CO2RR are studied. For boosting activity, selectivity and stability in these reactions an innovative approach, complementary to tuning nanoparticle properties, is employed. In this approach tiny amounts of Ionic Liquid (IL) are employed to modify the active site microenvironment. This SCILL approach (Solid Catalyst with Ionic Liquid Layer) was pioneered by us for heterogeneous catalysis in 2007 and is studied intensively, to leverage its full potential in electrocatalysis. As classical rotating disc electrode (RDE) studies are strongly limited in the achievable current density and cannot reach potentials where technical systems operate and furthermore show no true triple-phase-boundary, further efforts are needed to study catalysts under technical relevant conditions. For this purpose, in the etzoldlab on the one hand half cells based on gas-diffusion-electrodes are employed, which allows to study a triple-phase-boundary on a single half cell side without interference from either the counter reaction or polymer electrolyte membrane. On the other hand full membrane electrode assembly (MEA) testing is carried out on fuel cell testing stations. Important cornerstone for both techniques is the highly accurate and reproducible deposition of catalyst layers, which is carried out by robot assisted ultrasound spraying. G.-R. Zhang, T. Wolker, D.J.S. Sandbeck, M. Munoz, K.J.J. Mayrhofer, S.Cherevko and B.J.M. Etzold, “Tuning the Electrocatalytic Performance of Ionic Liquid Modified Pt Catalysts for Oxygen Reduction Reaction via Cationic Chain Engineering”. ACS Catal. 90, (2018) 8244. I. Martinaiou, T. Wolker, A. Shahraeia, G.-R. Zhang, A. Janßen, S. Wagner, N. Weidler, R.W. Stark, B.J.M. Etzold and U.I. Kramm, “Improved electrochemical performance of Fe-N-C catalysts through ionic liquid modification in alkaline media”.J. Power Sources 375, (2018) 222. T. Ariyanto, A. Kern, B.J.M. Etzold and G.-R. Zhang, “ Carbide-derived carbon with hollow core structure and its performance as catalyst support for methanol electro-oxidation”. Electrochem. Commun. 82, (2017) 12. G.-R. Zhang, and B.J.M. Etzold, “Ionic liquids in electrocatalysis”. J. Energ. Chem. 25, (2016) 199. G.-R. Zhang, M. Munoz, and B.J.M. Etzold, “Accelerating Oxygen Reduction Catalysts through Preventing Poisoning with Non-Reactive Species by Using Hydrophobic Ionic Liquids”. Angew. Chem. Int. Ed. 55, (2016) 2257. A) Boosting effect of imidazolium based cations with different alkyl chain length and [NTf2] as anions for platinum catalyst in ORR@0.9V; B) Schematic of half cell based on a gas-diffusion-electrode for achieving high current densities and technical relevant potentials. The research in heterogeneous catalysis bridges from screening towards detailed mechanistic studies as also from intrinsic kinetics to full process consideration. In this sense, transient-response-studies including isotope labeling (SSITKA), in-situ DRIFT and Raman spectroscopy are employed as also long-term catalyst studied in continuously operated rigs. These insights are complemented by kinetic and thermodynamic simulation as also flow sheeting. The later one gives insights how changes in catalyst activity and selectivity affect the up- and down-stream processes and e.g. total energy consumption or feedstock efficiency. Chemical conversions studied belong to the base chemical and gas phase sector. The focus is on partial oxidations like oxidative dehydrogenation and CO/CO2/H2 conversion to methanol and Fischer-Tropsch products. B. Kommoß, S. Klemenz, F. Schmitt, E. Hocke, K. Vogel, A. Drochner, B. Albert, B. J.M. Etzold and H. G. Vogel “ Heterogeneously Catalyzed Hydrogenation of Supercritical CO2 to Methanol”. Chem. Eng. Technol. 40, (2017) 1907. S. Knoche, M. Heid, N. Gora, D. Ohlig, A. Drochner, H. Vogel and B.J.M. Etzold, “Activity Hysteresis during Cyclic Temperature-Programmed Reactions in the Partial Oxidation of Acrolein to Acrylic Acid”. Chem. Eng. Technol. 40, (2017) 2084. M. Heid, S.F. Knoche, N.S.A. Gora, D. Ohlig, A. Drochner, B.J.M. Etzold and H.G. Vogel, “Dynamics of Bulk Oxygen in the Selective Oxidation of Acrolein”. ChemCatChem 40, (2016) 2390. A) Experimentally determined and simulated conversion of acrolein from steady‐state measurements and cyclic TPReaction experiment on 50Mo8V2W1.5Ox. 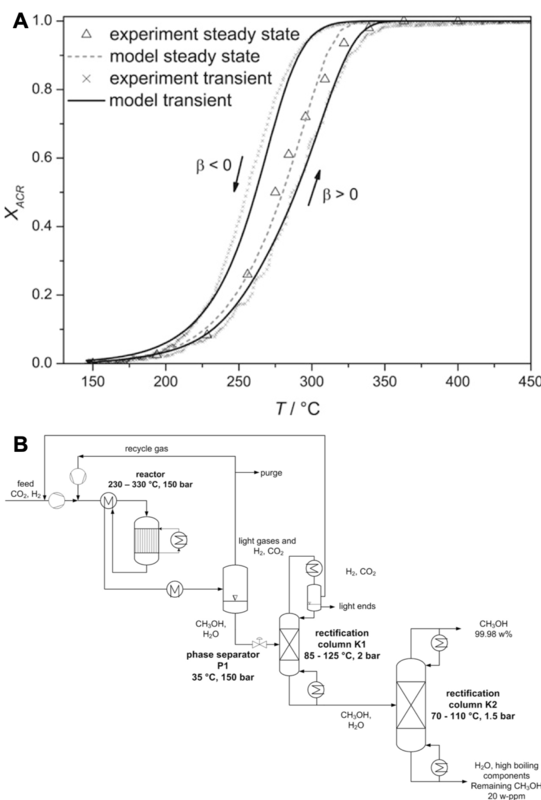 The arrows mark the curve of the positive (β = 10 °C min−1) and negative (β = −10 °C min−1) heating rate; B) Process concept for synthesis of CH3OH from CO2 and H2 making use of in-situ phase separation. Horizontal tubular furnaces for gas/solid reactions under corrosive atmosphere (Cl2) up to 1600°C.